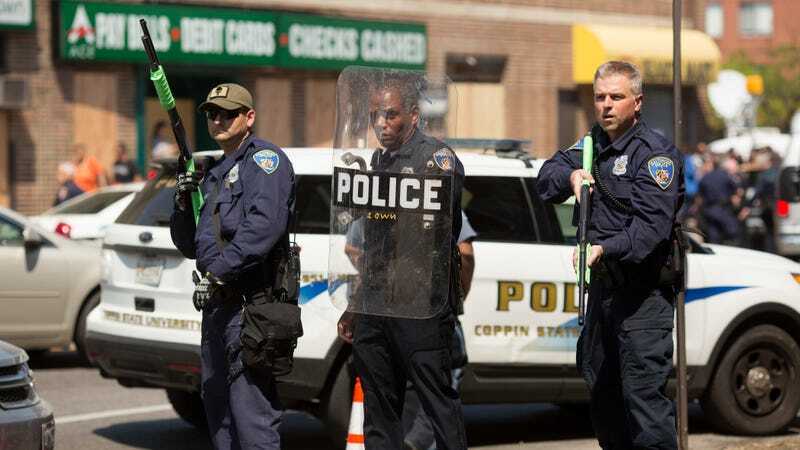 BALTIMORE, MD - MAY 4: Police form a line to block North Ave., near the site of recent riots and several blocks away from where Freddie Gray was arrested last month, May 4, 2015 in Baltimore, Maryland. Initial reports that a man had been shot by police sparked anger in the crowd. Officials later reported that no one had been injured and the gun, carried by a man seen on a security camera, had discharged accidentally. A new study from the University of Southern California (USC) suggests that there is a correlation between an increase in violence at protests and tweets with “moral content” concerning what the protest is about—like, say, police violence. But dig a bit deeper, and you’ll find that the study’s implications are more complicated than that. That argument alone feels painfully obvious. A protest at its core is centered around an issue people are passionate about—often because they believe something immoral took place. What’s more, the researchers were unable to look specifically at measurements of violence, but rather used hourly arrest counts as an indicator of violence. As the researchers point out in the study, this is “an imperfect indicator” because arrests and violence don’t always go hand-in-hand. In other words, the researchers appear to have found a correlation between “moral” tweets and arrests during protests, if nothing else. To draw their conclusions, the researchers looked at tweets related to the 2015 Baltimore protest over the death of 25-year-old black man Freddie Gray, who died from spinal injuries while in police custody. The protests were seen as predominantly peaceful, but also led to more violent rioting. The researchers took 4,800 of these tweets, which were “handcoded for moral content,” and used them to train a deep neural network. The objective was to train this artificial intelligence to predict whether each tweet of 18 million posted during the Baltimore protests was “moral” or “not-moral.” From there, the researchers determined whether the frequency of moralized tweets corresponded with instances of violent protests. “As not all protests are moralized to the same extent across time, place, and people, variance in moral attitudes can be measured and used to predict violence at protests,” Morteza Dehghani, a researcher at USC and one of the paper’s co-authors, told Gizmodo in an email, adding that violence does not always occur between police and protesters but can also include violence between protesters and counter-protesters. Based on the researchers’ findings, it’s not inaccurate to characterize tweets about a moral issue as a factor in predicting the likelihood of violence at a protest. The problem, however, is that it boils down a complex issue, undermining the number of factors that might predict future violence aside from a flood of “moral” tweets. Also, as mentioned, the researchers weren’t able to look at the empirical rate of violence from the Baltimore protests—because they didn’t have access to that data, they said—and instead looked at arrest counts, which doesn’t provide the full picture. So, while not an inherently flawed finding, it’s dangerous to suggest that violence is linked to passionate rhetoric online, especially given that the researchers didn’t use data on actual violence. It’s okay to use machine learning as a tool to better predict a disposition for violence, but when there are a number of other factors in place—unnecessary police force, for instance—it’s misguided to exclusively trace the signal back to some impassioned tweets. And, if such a model is more widely adopted, it speaks to a disconcerting future in which police and tech companies have an excuse to surveil peaceful protestors. Can’t imagine how that system might be abused.